San Diego’s annual Gator By The Bay, the largest, most-authentic Louisiana-themed music and food festival this side of the bayou will be held May 11- 14, 2017. Presented by San Diego’s Bon Temps Social Club, it features four days of live music with over 100 musical acts and special performances on seven stages, southern cuisine including 10,000 pounds of crawfish trucked from Louisiana, non-stop live music, dancing and family fun at Spanish Landing Park on beautiful San Diego Bay across from the airport. Times: Thurs., May 11: 6 – 10:30 p.m.
Fri., May 12: 3:30 – 10:30 p.m. Sat., May 13: 10:30 a.m. – 8 p.m. Sun., May 14: 10:30 a.m. – 7 p.m. Since its inception in 2001, the festival has grown to showcase an array of music choices from blues, salsa, zydeco, Cajun and a taste of country, including Grammy winning artists directly from Louisiana, legendary Chicago and California blues artists, rockabilly and roots performers and award-winning salsa and Latin bands. The festival has become an annual must-do for enthusiasts of all ages who have travelled from throughout California, and 39 other U.S. states, Canada, Mexico, Europe, Asia, New Zealand and Australia. The festival will kick-off with a concert headlined by Grammy nominated blues singer and pianist, Marcia Ball, on Thursday, May 11 from 6 – 10:30 p.m. The Texas-born, Louisiana-raised musical storyteller has earned worldwide fame for her ability to ignite a full-scale roadhouse rhythm and blues party every time she strolls onto the stage. In 2010, she was inducted into the Gulf Coast Music Hall Of Fame and in 2012 into the Louisiana Music Hall of Fame. She's received a total of six Living Blues Awards, nine Blues Music Awards and five Grammy nominations. •	Grammy-award winning Steve Riley and the Mamou Playboys from Mamou, Louisiana playing Cajun accordion, soulful fiddling and a blend of electric and acoustic guitar sounds for a new twist of traditional Louisiana folk music. •	Blues, soul, funk & rock and roll group Igor Prado Band from Sao Paulo Brazil, with local guest Whitney Shay on vocals. Igor’s music style mixes the blues with elements of swing and famous jazz dance hall sounds of the forties. •	Chubby Carrier and the Bayou Swamp Band, a Grammy-award winning band straight from Lafayette, Louisiana, playing a mix of traditional Zydeco with accordion and washboard with dashes of ‘70s funk and classic R&B to carry out the true bayou sounds of ”funky swamp” Zydeco music. •	Dennis Jones Band, a three-member rock and blues band with sizzling hot guitar solos, smooth and soulful vocals and high-energy performance. 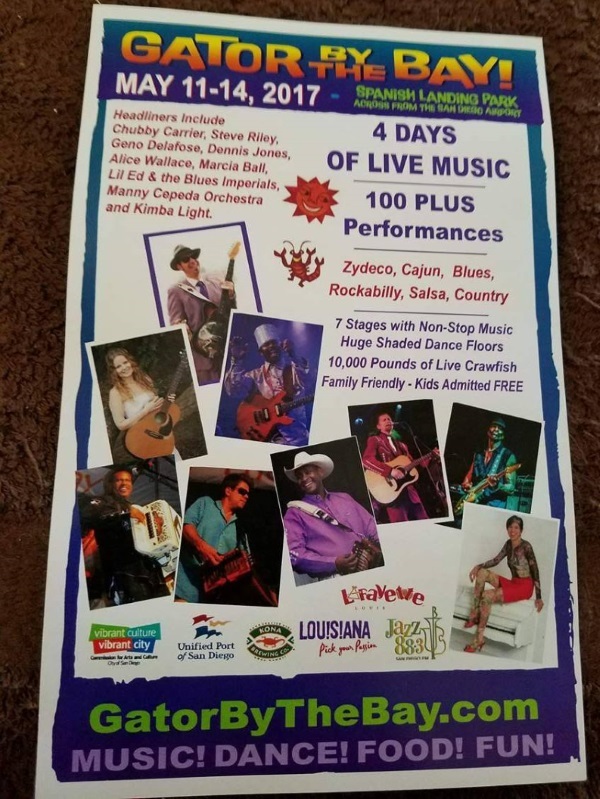 •	Grammy nominated Zydeco band Geno Delafose & French Rockin’ Boogie from Eunice, Louisiana. Delafose, a Zydeco accordionist and singer, is the innovator of the sound known as the nouveau Zydeco. His sound is deeply rooted in traditional Creole music with strong influences from Cajun music and also country and western. •	And many, many more to be announced soon. Single Day and Muliday Passes Available. It's the Most Fun You'll Find This Side of The Bayou!